Many reality TV shows are based in Las Vegas and now you can see several of them in person during this tour, which visits the sites where “Tanked,” “American Restoration,” “Counting Cars,” “Toy Shack” and “Pawn Stars” are filmed. With 30 minutes at each stop, you may even have a chance to meet the shows’ stars. Your adventure starts at the nation’s largest and most unique aquarium manufacturing company, Acrylic Tank Manufacturing (ATM), home to Animal Planet’s popular show “Tanked.” Next you will visit the homes of some of the History Channel’s top shows, starting with an exclusive stop at the garages from “American Restoration” and “Counting Cars.” This is the only reality TV tour that stops at these locations. You’ll also check out “Pawn Stars” toy expert Johnny Jiminez’ vintage toys at The Toy Shack. Last but definitely not least, visit the Gold and Silver Pawn Shop, home to the History Channel’s No. 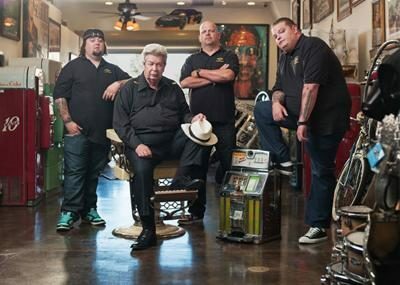 1 show, “Pawn Stars.” Catch a glimpse (and maybe even meet) one of the stars, including Rick Harrison, Richard “Old Man” Harrison, Corey “Big Hoss” Harrison or Austin “Chumlee” Russell. Note: The opportunity to meet and greet the shows’ stars is not guaranteed. Inside tours depend upon filming schedule. Rick’s Restorations is not open on the Saturday tour so guests will stop at Welder Up instead. WIN A 4 DAYS & 3 NIGHTS VEGAS VACATION GETAWAY!